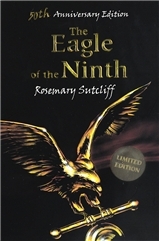 The Eagle of the Ninth by Rosemary Sutcliff: I read this too long ago to be able to do it justice, but I wanted to have some sort of record of the fact that I really, really enjoyed it. For those of you who don’t know, The Eagle of the Ninth is a children’s novel from 1954 set in Roman Britain. The story is about a young Roman soldier, Marcus, who becomes friends with Esca, his former slave. The two then embark on a journey to discover what happened to Marcus’ father, whose Ninth Legion disappeared somewhere beyond Hadrian’s Wall. The Eagle of the Ninth is a fun historical adventure complete with mysteries, exciting flights, and plenty of details that make the setting come to life but never feel crammed in. The main reason why I enjoyed it, though, was Marcus and Esca’s relationship. Sutcliff depicts their growing intimacy with subtlety and grace, and she doesn’t shy away from examining the power negotiations inherent to a budding friendship between a free man and his former slave. Also, I’m just a sucker for stories about boys having feelings at each other, okay? Especially ones as open and unapologetic as this. It’s very easy to read Marcus and Esca’s relationship with slash goggles, and needless to say this is an interpretation I give two enthusiastic thumbs up to. But regardless of whether or not you read their relationship as romantic, I’m very interested in Sutcliff’s portrayal of emotional ties between boys as central to their lives. I’m sure there are plenty of Rosemary Sutcliff fans out there, and my question to you is this: what should I read next? The rest of the Eagle of the Ninth series? Do these have to be read in order, by the way? Or should I perhaps try her Arthurian books? One of the historical stand-alones? Her adult novels? It’s very exciting that she has such a long backlist, but I could do with a little guidance. 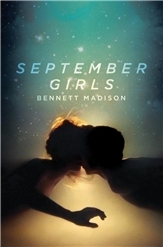 September Girls by Bennett Madison: some of you might be aware of the fact that this is a novel that completely polarised readers: while some found it misogynist in the extreme, others read it as a subversive and thoughtful examination of gender and sexuality. Instead of rehashing these arguments, I’ll just wait for a little bit while you catch up with the above links. Done? Right: I do think that September Girls examines hegemonic masculinity and its potential to dehumanise girls and boys in pretty explicit ways; having said that, I wouldn’t exactly say that I was a huge fan. I was thrown off by the odd pacing, even though I get what Madison was trying to do with it. The story is set in a seaside town during the summer, and the closing scenes in particular hint that this is a place where time is somewhat disconnected from “real world” time. And even if you leave these supernatural elements aside, there’s also the sense of timelessness you get at the height of summer when you’re young, when the golden days seem to stretch on indefinitely and you feel nearly immortal. September Girls tries to evoke this, but the trouble is that for me the attempt became indistinguishable from clumsy pacing, and as a result I found myself bored and unengaged for most of the novel. There are also all these questions of influence when it comes to YA that I don't think are asked (or asked nearly as much) about books marketed to grown-ups. Do YA writers bear an added responsibility to educate or inspire because our books are aimed at younger readers? Are there ideas and themes and language that can be dangerous to our readers, who (some would argue) might not have the capacity to understand it? These questions hinge, to me, on what's an essentially false premise: that adults are going to think critically about a book while teenagers will sort of just receive it unquestioningly. I don't think that's true at all—to me, teenagers are just as critical as any other readers. Maybe more critical. Personally, I don't think a ton about the fact that I'm writing for a YA audience while I'm writing. I just try to write the book I want to write. Anyway, I'm not sure there's a huge difference between teen books and adult books in terms of the actual readership, at least not these days. Adults read YA and teenagers read adult books, so it's like, who cares? Attachments by Rainbow Rowell: Can I just leave you with a “what Jenny said”? No? Alright, then: the premise of Attachments is the following: the year is 1999, the Internet is still new, and Lincoln has found a job as a web security guy for a local newspaper. Most people don’t realise this, but what his job actually consists of is reading his fellow employee’s e-mail to make sure they’re not doing anything they shouldn’t on company time. This is how he starts reading the personal e-mails two friends and co-workers, Beth and Jennifer, exchange multiple times a day. Lincoln becomes too engrossed in their lives to be able to give them the stern warning his job requires him to. Not only that, but he begins to fall in love with Beth. The trouble is, how do you approach a complete stranger whose personal e-mail you’ve been reading and tell them you should maybe get to know each other? There’s probably an interesting story to be told about how a relationship can survive this kind of creepy beginning, or grow in such a way that something like this doesn’t define it, but sadly Attachments is not that novel. Lincoln obviously has misgivings about what he’s doing, but his self-awareness is not a proper stand-in for an actual exploration of the power imbalance brought about by his illicit knowledge of Beth. This almost goes beyond the invasion of privacy: the fact that he has her at such a disadvantage, and that she couldn’t possibly hope to overcome this until they had been together for quite some time. Bachelor Girl by Betsy Israel: Once again, someone else has already said everything I’d like to say about this book, and said it better too — this time Aarti, who reviewed Bachelor Girl a few years back. 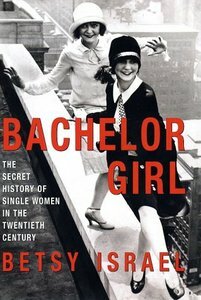 Bachelor Girl is supposed to be a history of single women in the twentieth century, which sounds right up my alley. Israel does mostly two things: one, she examine the lives of working women in early twentieth-century New York (which makes sense, considering how closely entwined marriage and financial subsistence really were); and two, she attempts to analyse the lives of single women through pop culture icons, which unfortunately doesn’t always get to the bottom of the issue. As you can probably gather from this, the focus of the book is quite a bit narrower than you’d initially expect. Bachelor Girl isn’t really a book about what the experience of being single was like for women throughout the decades, or a book about what else there was to their lives beyond being single, as no person’s life is defined by a single experience — which is what I wanted it to be. At the same time, though, it’s not really satisfying as a history of the portrayal of single women in twentieth-century pop culture either. It’s like it never quite decides whether it’s trying to be a cultural history or a social history, and as a result it feels lacking in both regards. 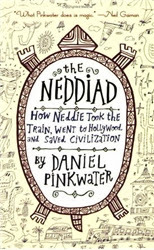 Lastly, I read The Neddiad and The Yggyssey by Daniel Pinkwater, the subtitles of which will probably give you a good feel for the books themselves: the first is “How Neddie Took the Train, Went to Hollywood, and Saved Civilization”, and the second “How Iggy Wondered What Happened to All the Ghosts, Found Out Where They Went, and Went There”. They’re technically part of a trilogy, but they’re really stand-alone stories featuring the same group of characters, though told from different points of view. The allusions to The Illiad and The Odyssey in the titles may have you thinking of big epic adventures, but they’re mostly just part of Pinkwaters’ playfulness. In a way Ned and Yggy’s adventures are epic — they do, after all, involve saving the world — but what keeps you reading is the voice more than the plot. Pinkwater’s narrative voice is wonderfully warm and humorous, and the novels have a feel to them that puts me in mind of, say, Sharon Creech or Michael Chabon’s Summerland. It’s also a feel that I’d describe as very American, though I’m not sure that I can explain just what I mean by that. It’s about more than just the road trips or the landscape or the use of mythology — the best way I can put it is, if certain classic British children’s books are narrated by a kind grandmotherly figure, then American ones are narrated by a fun, cool, slightly eccentric uncle. 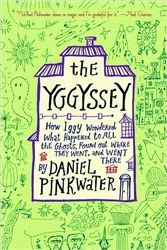 I’m very glad to have read Daniel Manus Pinkwater at long last: I kept seeing him mentioned as a favourite author by the likes of Neil Gaiman and Patrick Ness, and it turns out that he writes just the kind of big-hearted children’s novels you want to be reading through hard times. The Eagle of the Ninth was one of the formative books of my childhood, so I'm very glad you liked it! Next I'd read Mark of the Horse Lord, if you want more Roman Britain--it's referenced by Megan Whalen Turner in King of Attolia, which is very cool, and it just a tremendous book. Or if you want something a little different, with another great boy/boy friendship, another favorite of mine is Warrior Scarlet, which is set in the Bronze Age. I love how your brief reviews are like my complete reviews. I wish I could write with as much depth as you! I completely agree with you about Rainbow Rowell. Attachments, while I did like it, I didn't love it for the same reasons. It left me feeling somewhat dirty. But I could see where the brillint writer was starting to come out too. I really need to get on that Eva Ibbotson train. Aw, Daniel Pinkwater. I was read Lizard Music by my fourth grade teacher and have reread it a dozen times after that. It's so insane! So completely insane, and I expect the rest of his books are too although I've never read any of them. It's too bad Attachments doesn't explore that further since that is a really interesting idea to explore and I feel like there are other stories on this premise? (of one person "knowing" more than the other. but I can't think of any right off the top of my head) but yeah that's actually a very intriguing concept to me, the ways in which we know each other and how we obtain that information. Like...what sort of knowledge is meant for us. Ugh not explaining myself well, but in any case, too bad! That quote by Bennett Madison is brilliant, and makes me glad that people like him are writing. Also makes me definitely want to check him out, despite the fact that I'm not sure I've actually heard of him before now. "These questions hinge, to me, on what's an essentially false premise: that adults are going to think critically about a book while teenagers will sort of just receive it unquestioningly. I don't think that's true at all—to me, teenagers are just as critical as any other readers. Maybe more critical." Yes, that. I think, and I hope I'm not generalizing too much here, that many teens are all about asking the big questions, and they respond to literature doing the same. So glad you enjoyed Sutcliff! I can second both of Charlotte's recommendations. And add: as a teenager my own favorite--and possibly favorite book of all time--was The Shield Ring (functions as a standalone; I had not even known it was supposed to be part of the Eagle of the Ninth series until I looked on wikipedia just now). For a completely gripping standalone try The Outcast. And if you aren't worn out on Arthurian retellings, the beautifully minamalistic Sword and the Circle is one of the best ever. Yeah, I agree about Attachments. It was okay but it was missing something. I never felt truly connected to the characters. And I have not read September Girls, but like you I did link it with Lanagan's novel right away when I read the post of the Book Smugglers. I'm glad you enjoyed The Eagle of the Ninth I would really like to read it! The Silver Branch and The Lantern Bearers are good; Ron and I think you would enjoy them next. We didn't like the Arthurian novels quite as much but The Shining Company is quite a good one. We also like Song for a Dark Queen and liked looking at Black Ships Before Troy with our kids (lots of pictures). Walker loved Pinkwater novels for a while when he was about 8 or 9. Borgel was a big favorite, and he also liked The Hoboken Chicken Emergency. According to my reviews, I liked The Lantern Bearers the best! And apparently the series it's in is only loosely connected by family members? So you can totally skip around/read whatever without worrying about it, I think. 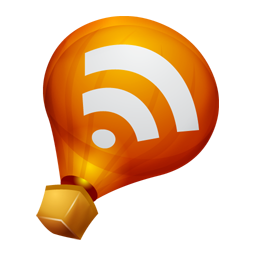 Jenny: Pinkwater is all over the place plot-wise, but somehow it all works. I think it's the voice that holds it all together. And please don't let Attachments put you off Rainbow Rowell! Eleanor & Park and Fangirl are both so wonderful. Amy: I agree - and if you can think of any stories that do that, I'm all ears. I do think that the knowledge that's meant for us or not is a huge issue, especially in the brave new world of social media. Like, I really appreciate the closeness of being told something directly by someone, but these days we share things online and hope they'll reach everyone more and more. But when I read, say, a tweet or a Facebook status update part of me still feels a little bit like I'm eavesdropping. I'm never quite sure if I'm supposed to engage with what people are saying, if it's mean for me, if I'll annoy them by presuming to interact. Kiirstin: It's impossible not to like someone who says something like that, right? Tasha: I actually felt that I did, which is why I wanted the novel to dig a little deeper. Have you read any of her other books? Iris: I hope you enjoy them as much as did! Jessica: Though! It's both fun and emotionally satisfying. Jeanne: Thank you very much for the suggestions! I've actually brought Black Ships Before Troy home from the library before, but then I was distracted by other books and it ended up going back unread. I loved the illustrations, though. Anastasia: Oooh, that's the one that won the Carnegie, so it would go very nicely with my project to read all the winners. I'd second -- or third, or whatever you're up to -- Mark of the Horse Lord. If you like Sutcliffe then Henry Treece might appeal to you as well. Man With A Sword is good. Pykk: Many thanks for the recommendations :D I don't think I'd heard of Treece before! The really problematic thing about this book, to me, is how it chose to cope with its iffy parts. I could actually forgive Lincoln what he was doing, because he was so clearly broken -- not in a terminal sense, he wasn't A Broken Person, but he was so unhappy and had so little. It seemed clear that he was fixating on Beth in a way that was irrational and too absolute, and was more to do with how much he needed his life to change, and less to do with this girl he only knew through emails to someone else. I thought I was reading a book about a guy who spent his teenage years drowning in this one girl, not seeing much of anything else, who was still hanging on to her ten years later, who was stuck in every way and was going to find a way to get unstuck, to have enough that he wouldn't need to be drowning in another person. Instead I found out in the last ten minutes that I was reading a completely different book: that every creepy aspect was kind of okay because she was creepy too, that even though this entire love story had been completely his story (while he was a bit character in her pretty eventful life), somehow she was right there with him on the same level of emotional intensity, that even though he only knew her through emails (and even though she admits to being a not completely reliable narrator), even though she knows basically NOTHING about him other than second-hand reports, somehow they're not just crushing, they're both head-over-heels in love in a way I'm clearly meant to accept as True Everlasting Love. None of it was extreme, none of it was a sympthom of their unhappiness with their lives; instead it's love at first glance and magic. Which makes perfect sense, if you assume that drowning in the other person forever so that you don't need anything else is the ideal, if you believe there's no air in space. But that was such a 180 on the book I thought I was reading.